For the past few years I’ve been reviewing the Out of the Park baseball management simulation series for the PC. 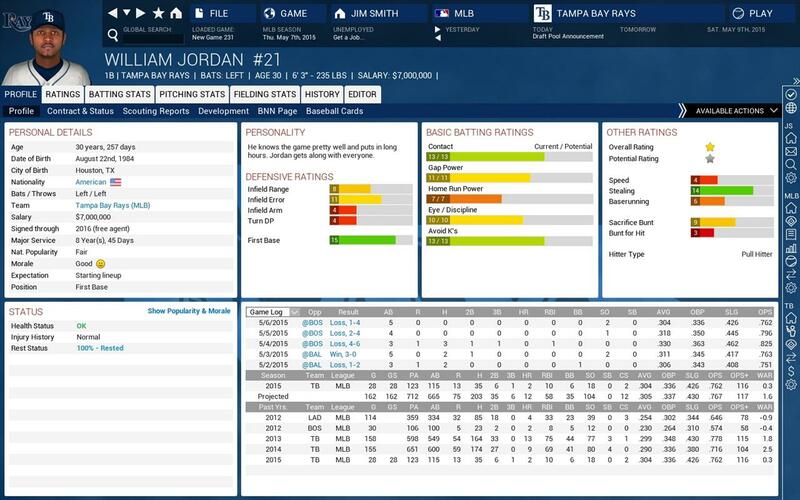 While the core gameplay tends to remain the same, OOTP Developments makes a lot of changes between releases that enhance the gameplay or add to the overall experience, and year after year they’ve consistently put out an excellent baseball management simulator. Does this year’s release follow suit? Let’s take a look at Out of the Park ’16 to find out. So for those new to the series, you might be asking yourself what all you can do in Out of the Park ’16. When the game starts up and you choose to create a new game, you can choose to create a standard game or a custom game. A standard game allows you to choose from not only teams from the U.S., but several international leagues such as Japan,South Korea, and Australia (Australia is new to this year’s edition), and play using the 2015 schedule and rosters. Something new to this year’s edition is that while the series has been using actual team names at least since I’ve been reviewing the series, the game now has actual player names and rosters and as of April 8th, the rosters should be locked into those for opening day. If you decide to create a custom game you have a few options to choose from. First, you can create a real world league where you can choose which leagues to use, then choose a few other options like scouting and recruiting options. Nothing big really. That’s saved for creating a fictional league. Here you can create a league however you wish, from choosing how many leagues, divisions, and sub-divisions, creating the teams, and so on. Whatever you want to do, go for it. Finally you can create a historical game. From what I’ve experienced this is kind of like playing a normal season except you can play a season anytime from 1871 to 2014. From this I’ve learned that there were very few US baseball teams back in 1871 (about eight). When it comes to custom games, nothing is off limits. Once you have your game setup (regardless of whether it’s a standard or custom game) you’ll set options such as your profile and what kind of decisions you want to have control over by being the Manager, GM, or both. You can also opt for Commissioner Mode which means you have complete control over the other teams and players in the league. You can then choose to not be fired by the owner, so no matter how poorly you do with your team, you’re sure to be with them next season. Finally, you can pick which league to play in (ie. the majors, AAA, etc.) and choose your team, or opt to be a free agent. Once everything’s done, the game begins proper with your “office”. Between games you’re able to view things such as team finances, league standings, upcoming events, and a lot more. There are eight boxes that you can change to multiple options to suit your needs. You will also receive news and emails from around the league which can include things such as injuries, reports on top players, and so on. At the beginning of the game the team owner will give you a few goals. This is another improvement over past titles. In the past the owner may give you a goal such as “I expect to at least make the playoffs” or “we should break even at .500”. Now the team owner will give you a few goals, both short term and long term. For instance, my goals for the Reds was to play close to .500 this season, sign Johnny Cueto to an extension, acquire a top player, and build a team that can win the championship in the next five years. It’s also worth noting that you can post these messages to your personal Facebook and Twitter accounts, just in case you want to keep friends and family up to date on how your team is doing. Now that we’ve fiddled around the office a bit, it’s time to get to the games themselves. Prior to a game you can setup options such as whether you or the AI will control various strategies and if there’s a pitcher warmup prior to the game (not sure why you wouldn’t want to warmup your pitcher). Once everything is set it’s time to take to the field. This part hasn’t changed a whole lot since last year. You have three different field views: broadcast, webcast, and 3D. broadcast gives you a lot of info and the field of view is a decent enough size to see what’s going on. Webcast basically looks like something you’d see online like on ESPN’s website. 3D…well, this is where I have to give a slight bit of criticism. The 3D option gives you a bigger view of the field while retaining most of the info from the other two options, but the only thing you’ll really see on the field during a play is the ball itself, from the pitch to where it goes after a hit. That’s fine, but it would be nice at some point to see the players on the field, even just to easily see who’s on what base and such. It’s not a major issue, just a little nitpick if anything, but worth pointing out. 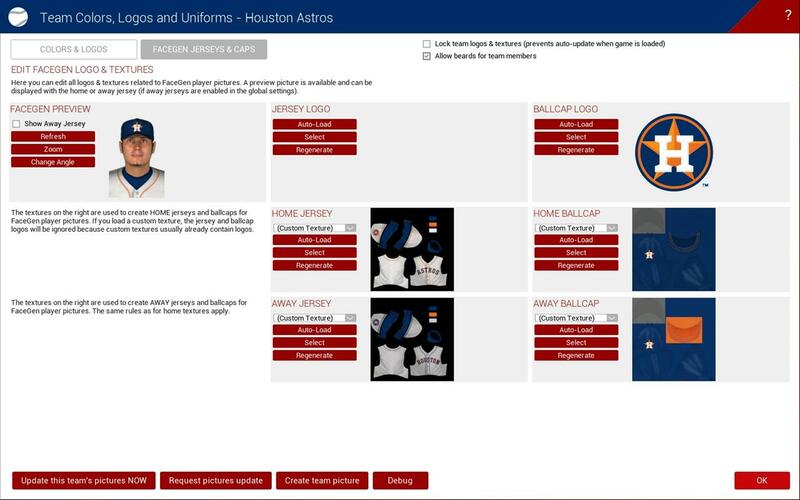 Since this is just a management simulator you choose from a few options whether you’re pitching or at bat and the game takes over from there. For instance, while pitching you can choose to pitch around, pitch down the middle, hit the batter, and so on, while batting lets you take the pitch, swing away, and so on. Normally when you choose an option it’ll occur on the final pitch of the at bat (so if you’re batting and choose swing away, the game will say something like it’s 1-2 and the end result could be strike three). However, you can choose to do things pitch by pitch if you want more control over your strategies. Now what if you don’t want to play an entire game? Maybe you don’t have the time. Out of the Park ’16 lets you simulate to any point during a game or season. 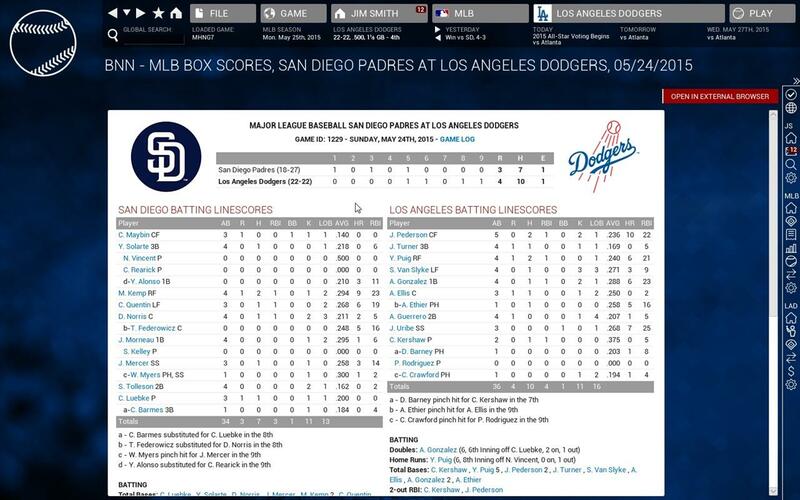 If you’re in the middle of a game you can simulate the current at bat, the current half inning, up to a specific inning, or even the entire game. 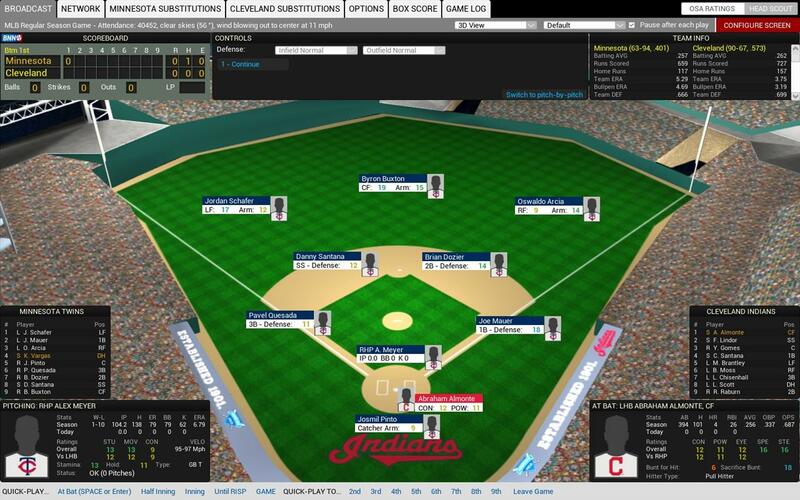 Between games while you’re back at the office you can simulate past the next game, to a specific date, or even to a certain event such as the All-Star break or the beginning of playoffs. 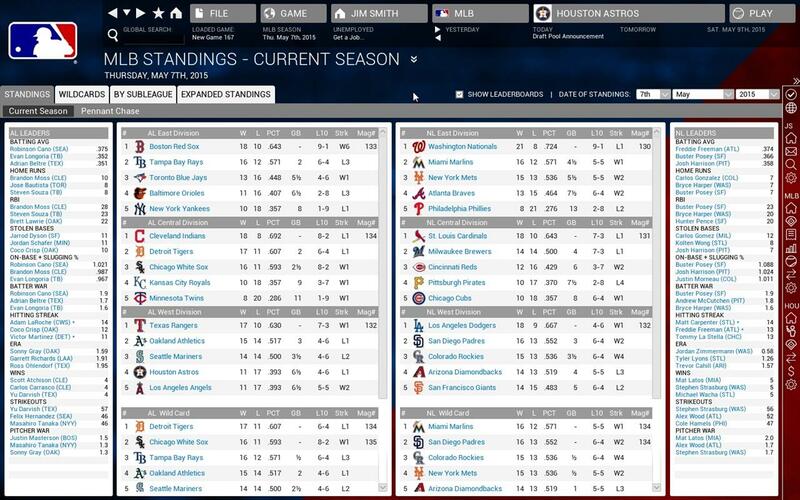 You can even just simulate the entire season if you wish and let the computer decide your fate. For me, I’d rather let the team sink or swim on my own terms, but to each their own. Before the game begins you can also choose to do a real-time simulation where the game will play out in the background with no input needed. It’s also nice that you can see other games going on at the same time. Some games will begin at later times and you can even speed up the simulation to make things go faster. On top of that, during your team’s game you can jump in and take over at any point. That’s essentially all there is to Out of the Park ’16. How you play is literally up to you. If you’re a veteran of the series there have been some changes and improvements to the series since last year aside from the few I’ve already mentioned. The team finances and reporting have been improved and the finance-related AI has been recoded to result in more realistic player contracts and negotiations. Playoff coverage has also improved and introduces a new Pennant Chase screen which displays the strength of the remaining schedule and your chances to make the playoffs. There’s also a new Find a Player option, a recoded All-Star Game with real voting including online league support, and more. I’ve made mention in the past that I’m not that great at any type of simulation game, but the Out of the Park series is one that I’ve enjoyed since I first reviewed it several years ago. 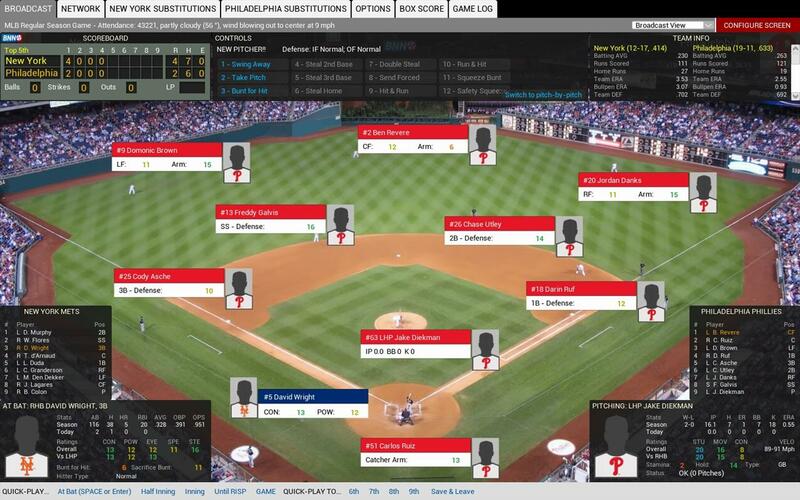 While you’ll never see me try to manage a fantasy baseball team, it’s nice to try and attempt to actually run a baseball team and the Out of the Park series has so much to it that you can literally do whatever you want. If you’re looking for a baseball management simulator, once again you should look no further than the Out of the Park series. While last year I mentioned that I wasn’t sure if the price was worth the upgrade if you had the previous year’s version, this year I think it could be with all of the changes and additions. It’s also worth noting that Out of the Park ’16 is available on Steam as well as a standalone game to download, so you have a couple of options to work with. If there was anything I had to criticize, it’s the 3D field view. As stated you can change your view on the fly during a game and I tend to use the 3D view simply because it provides a better view of the field in my opinion, but it would have been nice to have something else shown on the field during a play other than just the ball, such as runners on the bases or even show the ball being fielded instead of just where it lands after a hit. Again, this is a minor criticism but it would add a bit to the 3D view. Beyond that though, this is an excellent game and if you’re into sports management simulators, Out of the Park ’16 is one you don’t want to pass up. Out of the Park ’16 proves once again why it’s the go-to series for baseball management simulators. With the new license to use real MLB players and the other additions and improvements, there’s not much you can’t do in this year’s edition. 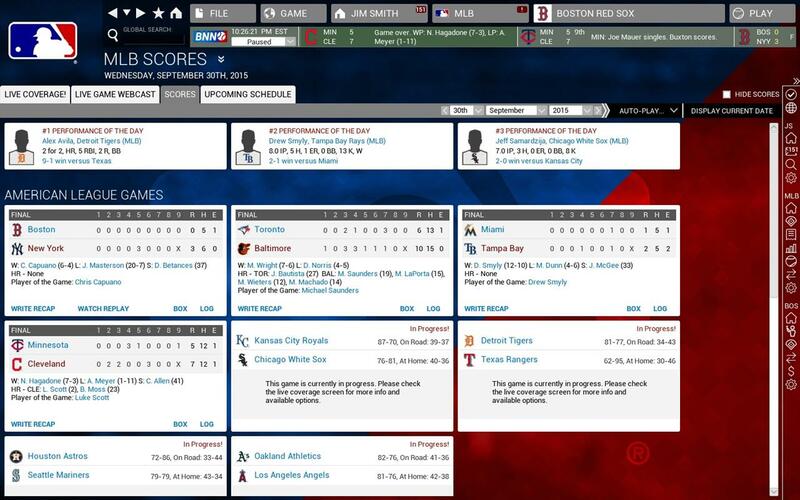 If you’re looking for a great baseball management simulator, you’ll be hard pressed to find something better.